These New Ultrathin Rubber Skins Can Make Airplane Cabins 100X Quieter! Scientists from MIT and North Carolina State University teamed up in order to design thin rubber mufflers or membranes, capable of sound-proofing the interior of planes. If you have ever sat in the back of the plane, the humming noise can make it hard to sleep and simply have a comfortable flight. 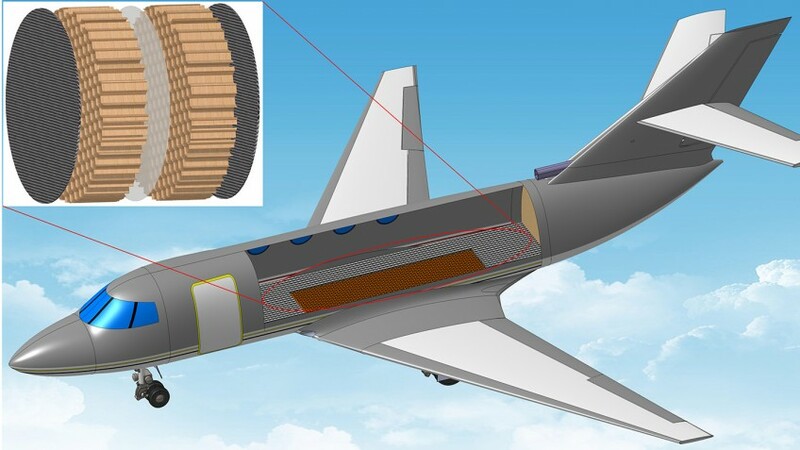 These new rubber membranes act similarly to acoustical tiles and can be stretched over the honeycomb-like structures and carbon fiber that make up the body of many planes. The end result is muffling sound, upwards of 100 times quieter in the cabin, while avoiding adding too much bulk or weight to the aircraft. “At low frequencies—sounds below 500 Hertz—the honeycomb panel with the membrane blocks 100 to 1,000 times more sound energy than the panel without a membrane,” says mechanical engineer and study author Yun Jing. If the ultrathin rubber skins prove to be viable, look for them to eventually be used in helicopters as well, creating a much quieter flight.